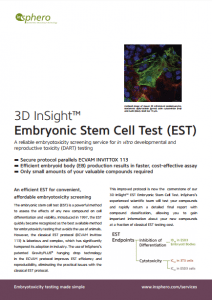 The embryonic stem cell test (EST) is a powerful method for developmental and reproductive toxicity (DART) testing, used to assess the effects of any new compound on cell differentiation and viability. Introduced in 1997, the EST quickly became recognized as the best available method for embryotoxicity testing that avoids the use of animals. However, the classical EST protocol (ICCVAM/ECVAM INVITTOX No. 113) is laborious and complex, which has significantly hampered its adoption in industry. We incorporate InSphero microtissue production technologies into the ECVAM protocol to improve EST efficiency and reproducibility, eliminating the practical issues with the classical EST protocol. The EST consists of 3 cell line-based in vitro assays determining a compound’s ability to inhibit differentiation (ID50) of ESD3 EBs into beating cardiomyocytes, and its cytotoxicity (IC50) in 3T3 and ESD3 cells. Increasing efficiency in production and handling of EBs reduces total assay time by 30%. Download the brochure to learn more about the ECVAM classification system and view validation data. embryotoxicity in an animal-free assay.